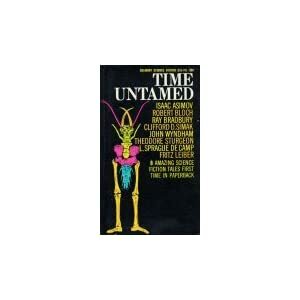 I finished up a book of short stories called Time Untamed. It was published in 1967 by Belmont Books. Collection of big names: Asimov, Bradbury, Clifford Simak, Fritz Leiber, Wyndham, Theodore Sturgeon, Robert Bloch, L. Sprague de Camp. It has a weird mix of stories though. The Bloch, Sturgeon and Leiber stories are pretty straightforward horror stories. L. Sprague De Camp's is fantasy. While the rest are sci-fi, it was just a strange compilation. Not even very sure why the collection has the title Time Untamed, only one story, Bradbury's "Tomorrow and Tomorrow", has anything to do with time travel. The Asimov story is "Sally" and after reading it I wondered if the people at Pixar are fans of Asimov. Sally is the name of a car in the short story and in the movie Cars and the description in the story is similar to how she looks in the movie. The cars in the story don't speak but they do have positronic brains. I really enjoyed the collection but am just puzzled on how/why these stories were collected together. Recommended!